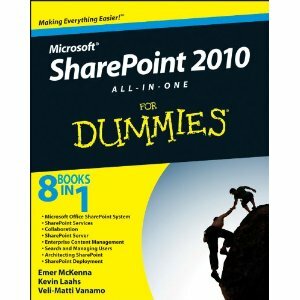 SharePoint 2010 for Dummies – that must be for me! The redoubtable team of Kevin Laahs, Emer McKenna, and Veli-Matti Vanamo have gotten into the saddle once again to produce SharePoint 2010 All-in-One For Dummies (also available from Amazon.co.uk ). The book is scheduled for publication on 4 November 2010 so treat this as advance notice together with some background. This eclectic combination of a Scotsman, known mostly for appearing at conferences in a kilt (he will do anything to get a high score from an audience), a wee Irish lassie (who confuses the children of Sacramento with her accent when she talks about cows and other animals), and a Finn (living in Ireland instead of enjoying the lakes, trees, and red-hot saunas in Finland, but we can’t all be perfect), first came together with Don Vickers to write a SharePoint 2001 book for Digital Press. Amazon.com says that the SharePoint 2001 book is still available, so those of you who need help with SharePoint 2001 can go and buy Microsoft SharePoint Portal Server: Building Knowledge Sharing Applications. Somehow I suspect that few will pick up this particular volume. SharePoint 2001 was actually quite a product. Despite its undoubted limitations (scalability and management to name but two), it proved that it was possible to deploy department-level collaboration at a fraction of the price that many companies were then paying. I also believe that the appearance of SharePoint 2001 marked the death knell for public folders in Exchange. Public folders had never reached the potential promised when they appeared in Exchange 4.0 in 1996. Sure, they had a reasonably effective replication mechanism to get information close to readers (as long as administrators didn’t rehome the folders to servers located in interesting places scattered around the planet), but the user and management interfaces for public folders were really awful. Up to the time that SharePoint 2001 appeared, Microsoft had no answer for customers who wanted to move away from public folders, but then Microsoft dropped the ball in a very comprehensive manner by never providing integration and migration facilities to allow customers to share information between public folders and SharePoint and eventually to move all the data, including metadata and permissions, from public folders to SharePoint. The upshot is that public folders still persist today – or maybe linger in limbo as the great cockroaches of Exchange. Leaving the ignored opportunity to transition from public folders aside, it’s fair to say Microsoft reset the whole content indexing and search market with SharePoint 2001 and one of the best initiatives I ever pushed inside Compaq (at the time) was the implementation of SharePoint as the collaboration infrastructure for the company. After the HP-Compaq merger, SharePoint made even more of an impact as it helped us to eliminate some very expensive UNIX-based document management systems at a time when HP was pretty focused on eliminating cost to justify the merger. Apart from being expensive, the UNIX-based system was pretty unusable in terms of finding information, unless you had taken a three-week course in how to categorize documents according to the prevailing wisdom of those who had designed and implemented the system. The relative simplicity of SharePoint provided a huge contrast! Kevin, Emer, and Veli-Matti produced their second book to cover SharePoint 2003 “Microsoft SharePoint Technologies: Planning, Design, and Implementation” and then for SharePoint 2007 with Microsoft SharePoint 2007 Technologies: Planning, Design and Implementation . I suspected that this book would have been their last as a team, if only because Kevin told all and sundry that he would never write a book again. I’ve never written a book as part of a team and it must create a very interesting dynamic at times when you can blame someone else instead of yourself! You may assume that a book labelled “Dummies” implies that it’s really an entry-level text that won’t provide much useful information to anyone who has worked with SharePoint before. That’s not true as the “Dummies” label has strayed far away from its original purpose of providing very accessible and easily understandable descriptions of technology to a point where some of their books contain in-depth technical information that you won’t find elsewhere. I think that this book is in the latter category and you won’t do badly if you buy it to gain some help with SharePoint 2010 and to understand how the technology can be used effectively to solve real-world problems. Recommended! This entry was posted in SharePoint 2010, Technology and tagged SharePoint 2010, SharePoint 2010 book. Bookmark the permalink.